I want to write a blog post on Copley's Watson and the Shark (1778, shown left) for my friend "e." She has been a long-time reader of this blog, and due to some significant changes in her life, she won't be able to get online and read blogs for some time. She particularly likes this painting, so I thought this post would be a fitting tribute to her. This painting is interesting to me for several reasons. First of all, this painting is interesting because Copley probably had never seen a shark when he painted this scene!1 In fact, at least one contemporary critic sensed there was some inaccuracy in the way the shark was depicted, saying that the shark "bore no resemblance to any creature on earth. "2 I wouldn't go that far (!) - but I don't think that the shark is perfectly realistic. In addition, the I think subject matter of this painting is interesting since it is based on an actual historical event. In 1749, a fourteen year old boy named Brook Watson was attacked by a shark while swimming in Havana Harbor. 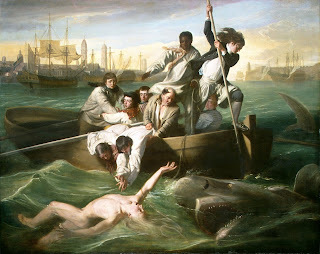 The shark struck twice, consuming Watson's right foot and flesh from his right calf (notice in the painting that Watson's right leg eerily disappears at the bottom of the canvas). Copley depicts the moment where Watson was saved by rescuers, just as the shark was rearing for a third strike. Watson's leg was amputated just above the knee. Watson managed with a wooden leg (as can be seen an etching of Watson created by Robert Dighton in 1803). He eventually became a successful merchant, and it is likely that he commissioned Copley to paint this scene for him, since Watson owned the painting at the time of his death.3 Honestly, I'm quite surprised that Watson wanted a have a painting which depicted such a traumatic event in his life! If I was ever attacked by a shark, I don't know if I would want the event immortalized in oil and canvas! This painting holds some significance art historically, since it depicts a real-life event in the tradition of "history paintings." Typically, history paintings (which were considered to be the most important type of painting by artistic academies) consisted of biblical or mythological scenes. Copley breaks from the traditional representations of history paintings by depicting an obscure event from recent history.4 He even elevates this obscure event by depicting it on a grand-scale: the large canvas is approximately 5' 7" x 7' 6" (182.1 cm × 229.7 cm). If you're interested in learning a little bit more about Watson and the Shark, check out this mini-site that is maintained by the National Gallery of Art (Washington, DC). 1 For more examples of art that was created without the artist having seen the animal beforehand, see my prior post, "The artist had never seen a [insert animal] before." 2 Louis P. Masur, "Reading Watson and the Shark," in The New England Quarterly 67, no. 3 (Sept. 1994): 437.